Arizona Apaches are Native American people identifying or identified as members of an Apache tribe or reservation sampled in the state of Arizona. Apaches were among the first Native Americans to ride horses into battle. In preparation, a warrior would decorate his horse to reflect his personal honors such as enemies killed or horses stolen. 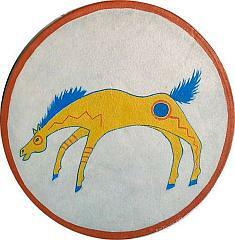 The most sacred of all symbols in all Native American cultures is the circle, however, which for the Apache is most potently embodied in its chief symbol, the sacred hoop. Apache Indians are a nomadic hunter-gatherer society and much of its culture and symbolism is rooted in nature. Since the appearance of Europeans in North America, Apaches have been incorrectly conceived as an aggressive warrior people and not as artisans and artists. Today, many traditional Apache art forms are still thriving and many Apache artists have taken traditional symbols and themes into modern mediums. Famous Apache Indians include Geronimo, Victorio and Carlos Montezuma. “Godfather of Soul” James Brown had Apache admixture. The Native American – Arizona – Apache population data represent DNA samples from 99 Native American (Native Americans in the United States) individuals in the state of Arizona’s Apache tribes. Samples were provided by the Arizona Department of Public Safety. 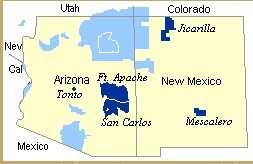 Map showing locations of present-day Apache groups.